VIEWS... VIEWS... VIEWS... OCEAN AND WHITE SAND BEACH ALL ROOMS. THE MELODY OF SURF WAVES BREAKING ON THE SHORE ALL DAY AND NIGHT... BREATHTAKING GOLDEN SUNSETS FROM THE LANAI/PATIO AT COCKTAIL HOUR! 'FREE' Unlimited Long Distance Telephone & Fax to All USA and CANADA. High speed internet. Fantastic million dollar views from this corner ocean front condo. No place is more beautiful along the Kona Coast. Comfortable large lanai/patio with up to eight to ten feet translucent crystal blue waves breaking just 100 feet away at Honl's beach which is considered one of the world'S best surfing beaches. Surfers and boogie boarders entertain all day. In fact, the boggie board was first invented by a surfer at our (Honl's)beach. Scuba and snorkeling from the shore with an awesome undersea aquarium. Abundant coral reefs give refuge to limitless fish and wild life. Turtles can be seen popping their heads above the water lapping along the shore just below the lanai. Restaurants and shopping just minutes away along the ocean walk to the Kona Village less than one mile stroll away. A number of modern shopping centers with supermarkets (Safeway, Sac'n Save, and more just up the hill from the shore. Costco, Home Depot, Lowe's nearby. Major world renowned golf courses and world record marlin fishing are near by. Swimming, hiking, and bicycle riding everywhere at the home of the world famous 'Ironman Triathlon' held every October. The condo complex has an ocean front pool, Jacuzzi, Barbecues, and party patio. The Condo is fully-equipped with a washer and dryer, stove and oven, dishwasher, fridge and freezer, microwave cooking utensils, blender and toaster, and just about all you need including beach towels. Besides the beds in the two bedrooms, a comfortable queen airbed with built in pump is available if needed..
Feel free to message us with any questions and you will receive a prompt reply. Have loved Hawaii for over 35 years. Beautiful Ocean Front Tropical Breezes All Day and Golden to Blue Sunsets Nightly. The Sound of Surf Pounding on the Shore Creats a Melody to be Remembered. Nearby there are many places to play. We loved the condo and the complex. On the lanai we some some of the most beautiful sunsets of our lives. The location was fantastic. Easy walk to Shops, farmers market and restaurants. The BBQ area had 4 excellent BBQs that were always clean. There was even had a sink. The condo was beautiful. Be careful though as there is only salt and pepper. Bring anything else you may need. There was also aluminum foil and we purchased Saran Wrap that was left there. Everything in the condo is clean and beautiful. This condo was perfect for my husband, myself and our 20yr old daughter! With 2 bdrms and 2 bathrooms it gave us plenty of room to spread out. 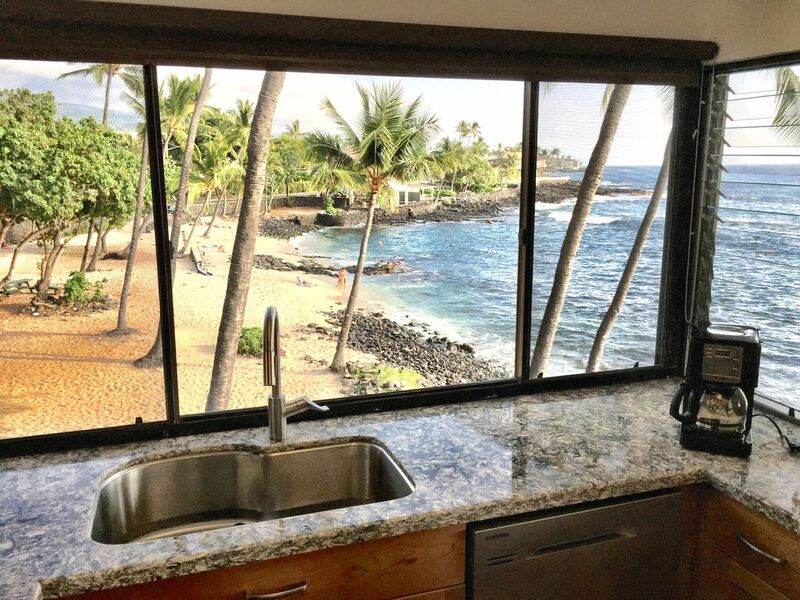 The kitchen and living room were both a good size that opened onto the lanai with more than 180 degree views of the ocean just feet away! The public beach outside the kitchen windows was nice although we didn't go down there much but to explore a bit, although for a public beach it didn't get too crowded, there was an occasional snorkler (but seems a bit rough for that), boogie boarders and surfers. Just in front of the lanai we also saw a few turtles that would rest on the rocks or in the tide pools so that was fun. The kitchen had plenty of utensils and we tried to do breakfast everyday at the condo rather than going out. Quick trip to Safeway not far away to pick up on supplies worked great! My daughter is also a college athlete so we found a gym nearby for her to get her daily exercise in, so that worked out perfectly and just over a mile away. If you're interested, it was called Forever Fitness, and you could pay for the day or the week for a very reasonable rate. The condo was only a 5 minute walk to town/shops/restaurants, and Huugo's/On The Rocks was a go to for either take out or dine in. We were all over the island, so did a lot of driving but really an easy location to do that. The owners Ken and Dia were very accommodating, and the staff at the front desk helped me set up our discounted Body Glove Dinner Cruise, which was a really nice 3 hour cruise. All in all, we were all very happy with this condo and location! Best views in the complex. A very easy walk into town! Great pool and BBQ area. 5 th visit to this condo! Thank you for taking the time to give your comments, and we are glad you enjoyed your stay. We look forward to your return in the near future. This condo is all about the view. If you were any closer to the ocean, you'd be in it. Gorgeous sunsets from the spacious lanai. Had a lot of fun watching the surfers and body boarders who gather off shore from dawn until dusk. The waves at the beach were too rough for us to swim, but you are within driving distance to better swimming spots. The view from the kitchen window is also gorgeous and lends itself to some serious people-watching. The public beach below is a constant stream of activity from yoga classes, to a tight-rope walking session, to sunbathers. It's also a hang-out spot for some homeless people. We woke up a few times to one man (we think he lives on the beach) screaming at the top of his lungs. The unit is clean and tidy, though the bathrooms need sorely to be updated. Bedrooms and main living areas are well-done. The kitchen is nice but completely empty of any food supplies, so you will need to buy even the most basic condiments. The A/C is really just a wall unit in the living room. There are ducts that begin in the living room closet, which then funnel the cold air into the bedrooms. The system requires the closet to remain open to allow the air to flow. The bedrooms still stay fairly warm, even with ceiling fans on. (The ceiling fan in the master bedroom actually shorted out on our first night. Maintenance couldn't figure out the problem. After 2 days without the fan, they figured out they could trip the switch on the fuse box to get the fan back on. But because the ceiling fan and light were on the same switch, we couldn't use the overhead light or everything would short out again. At least there were bedside table lights we could use). We took one of the standing fans from a bedroom closet and placed it in the hallway to get more air to the bedrooms. We also put a standing fan next to our bed. No air flow to the hallway bathroom, making it very hot if you were in there for more than a couple of minutes. The master bathroom at least had a window to open. The rental office staff is friendly. The pool area is nice and well-maintained. Thank you for taking the time for your feedback. The items you mentioned were addressed. This condo was in a great spot, right on the water, with an amazing view, and was set up well. Very clean and comfortable. Parking was brilliant and easy, no problem finding parks. Short walk to main beachfront bars and cafes. The cooking facilities and equipment were more than adequate. Communication and the check in arrangements were good. We stayed 15 nights, and could not fault it. Mahalo for your feedback. We are glad you enjoyed your stay and look forwar to your return in the near future. This is the perfect location to explore downtown Kona and all it has to offer! Great space, perfect porch for meals while you watch the waves and the sea turtles. Has everything you could possibly need to relax while you enjoy the Big Island, including swimming pool and convenient parking garage. Thank you for your feedback. We are glad you enjoyed your stay and we look forward to your return in the near future. Pickleball Courts near-by. Cancellation: Reservations dates are held for you while all others are turned away. In event of cancellation, only the amounts recovered by renting to another guest would be refundable. There is no refund for unused days.